Whether you have 15 or 500 employees in need of training, Noria can offer expert instruction at a time and location that are most convenient for your group. Additionally, Noria can customize any of its courses based on your needs. Noria provides onsite training for employers wishing to avoid travel time/costs. This can include personalized training with examples from onsite equipment. Our customers have used this option to rotate groups of employees through consecutive one-day trainings and to bring personnel from multiple plants to one onsite training. Noria is committed to providing options that will have the smallest impact on your production. Designed to impact performance, Industrial Lub rication Fundamentals caters to those with little to no technical background needing a strong foundation in proper lubrication and contamination prevention. This course uses interactive exercises, case studies, and hands-on examples to maximize student learning. Machinery Lubrication I (ML I) introduces students to the broader scope of lubricant types, physical properties, additives and ideal uses across a wide variety of machines and industries. Students have the option to test for International Council for Machinery Lubrication (ICML) Level I Machinery Lubricant Technician (MLT) or Machine Lubricant Analyst (MLA) certification. 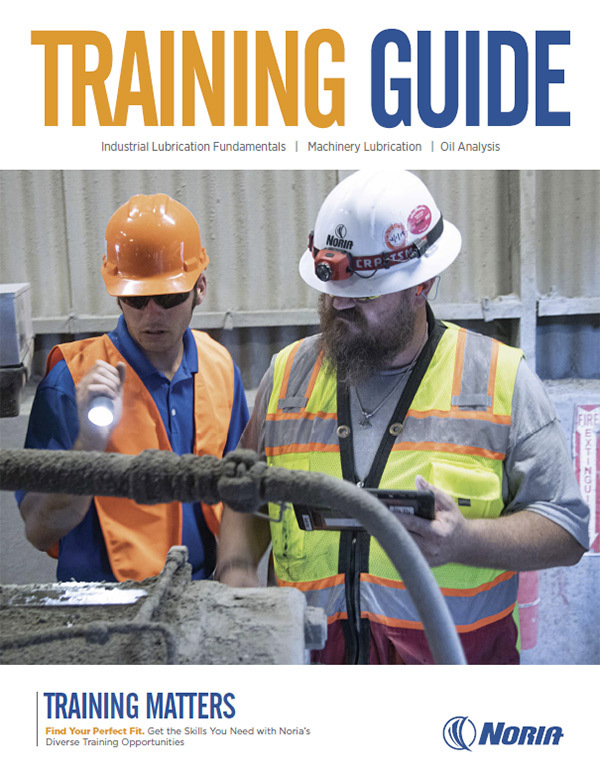 Machinery Lubrication II (ML II) delves deeper into even more specialized aspects of lubrication system design, lubricant types/selection, application, and troubleshooting. Building on material from Machinery Lubrication I, ML II adds a focus on expanding the life of machinery and lubricants by preventing unnecessary wear/contamination. Students have the option to test for ICML Level II MLT certification. Oil Analysis II (OAII) focuses on extending machine and lubricant life by emphasizing proper fluid analysis. Students will learn how to ensure accurate sampling and how to translate minute lubricant adjustments into major savings. Students have the option to test for ICML Level II MLA certification. Oil Analysis III (OAIII) expands on the topics covered in Oil Analysis II to bring students to a highly specialized level of diagnostic analysis and proactive maintenance. OA III students have the option to test for ICML Level III MLA certification. Want more information about onsite training? We can customize our courses to meet your unique needs. Call 918-392-5055 to explore the options with one of our representatives. Interested in certification? Our courses help prepare your employees for ICML certification exams. Training creates the foundation that enables the employee to perform specific projects and respond to crisis situations with an arsenal of early response techniques. Certification is an important part of the training process because it confirms your team possesses the skills necessary to do the job. Combining training with certification creates a knowledgeable and valuable employee. The International Council for Machinery Lubrication is a vendor-neutral, not-for-profit organization founded to facilitate growth and development of machine lubrication as a technical field of endeavor. Among its various activities, ICML offers skill certification testing for individuals in the fields of machine condition monitoring, lubrication and oil analysis. For more information about ICML or certification testing, go to www.lubecouncil.org or call 918-259-2950.